The Hamilton party joined me for the third morning this week with our sights set solely on big reds. We had a perfect low tide that would concentrate schools of reds on the flats. Once we posted up and put out chunks of cut mullet, the rods started whipping over! 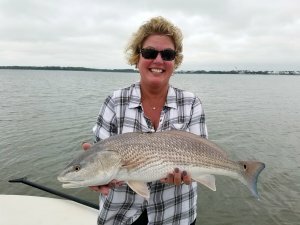 Sharon’s seven pound personal record was the fish of the charter. The charter began as the tide just turned and started falling. Fished the duration of the trip with popping corks and mud minnows. 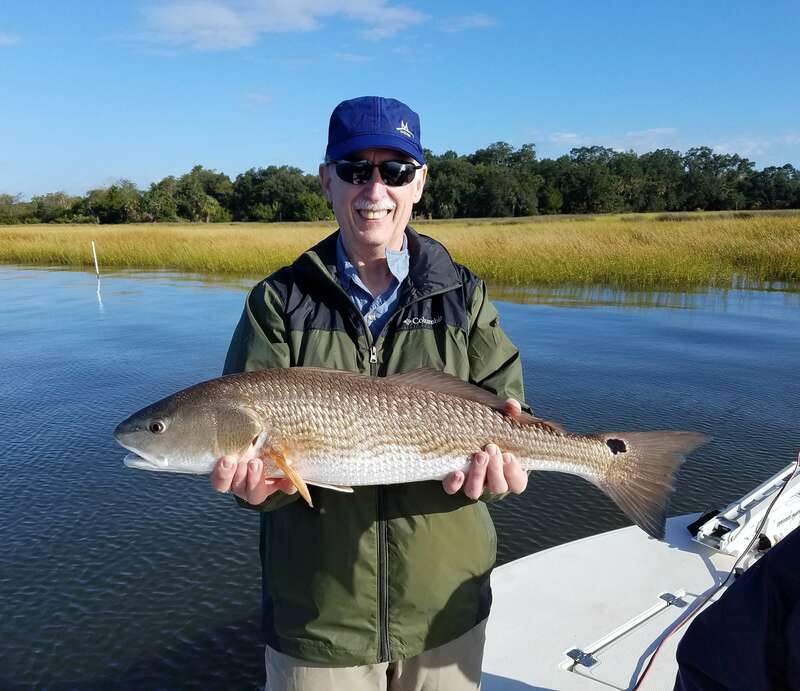 Wherever we could find current and bait, the corks kept dropping as reds and trout kept hitting. 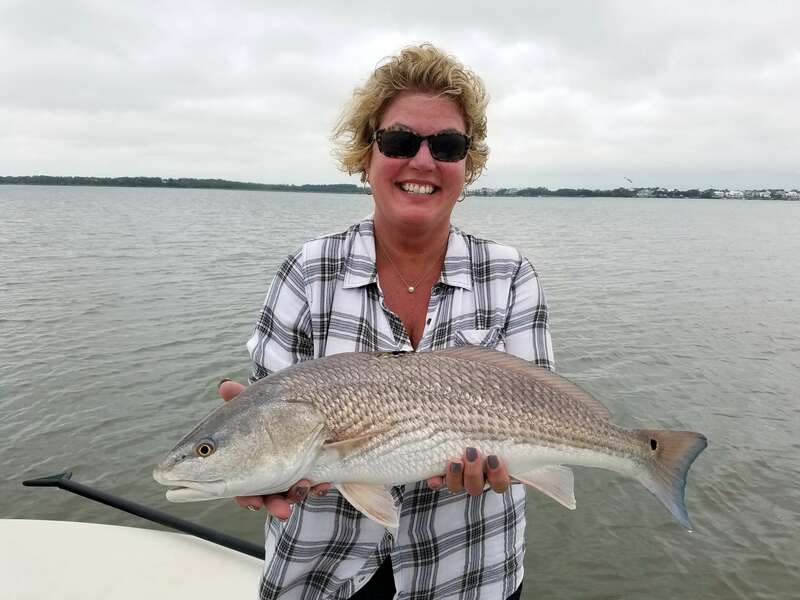 Highlight was this 8lb red that ate so close to the boat we could literally see it rise up and inhale the minnow! After a couple of weeks of very windy conditions, the weather has thankfully calmed down and water clarity is improving. 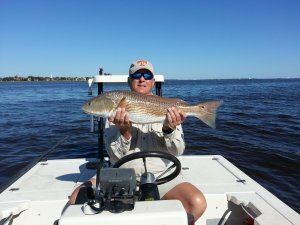 Redfish will start to form bigger schools and sight fishing on the flats should be great. We are throwing jerk shad artificial lures about 4″-5″ in length and in hues of blue and grey. I rig these lures on size #3/0 flutter hooks that provide great action. Artificial paddle tail lures have begun to really produce for trout. I’ll use a 1/4oz. jighead and tie a loop knot to give the lure even more action. Vary your rate of retrieve as you search for pockets of fish. Again, we’ve been staying with darker colored artificials. To make your lure even more attractive, try putting a piece of shrimp on the hook. You can use pieces of live or frozen shrimp and it will put a scent trail on your lure that is hard to resist. Fly fishermen are also enjoying the combination of larger schools of redfish and cleaner water. On clear days, you can see these packs of redfish swimming in circles with their golden backs flashing in the sun. Take your time when approaching the schools and when you make your first shot make sure to cast to the edges so as not to spook the school.